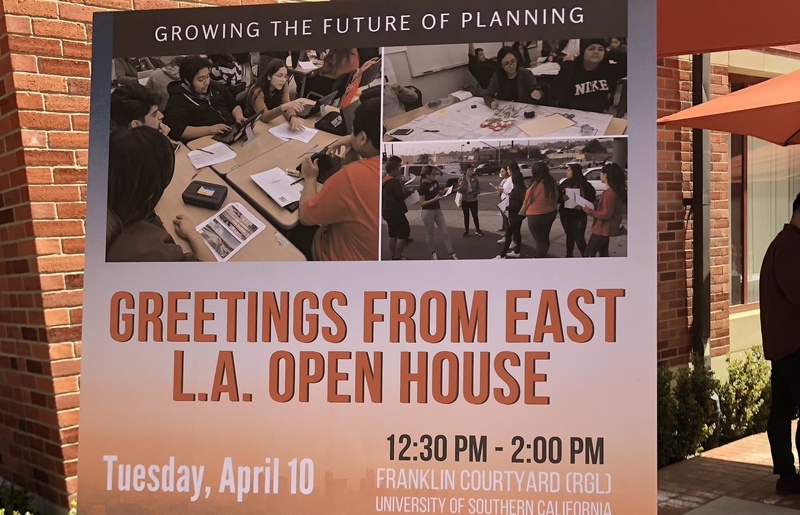 April 10, 2018 – At the first Open House of Spring 2018, the students from East Los Angeles Renaissance Academy at Esteban E. Torres High School presented Greetings from East L.A. at the USC Sol Price School of Public Policy. USC students, faculty and admin “visited” the landmarks of East LA via the students’ multimodal and active transportation tours. Each tour focuses on a specific theme and features destinations that students chose for their history and importance in neighborhood life. In the buzzing plaza, USC Price Interns concurrently led attendees through infographics created with data from the Renaissance students’ transit diaries. Kudos to project partners: ELARA Teacher, Dr. Scott Cody, and Principal, Martin Buchman; Public Matters Fellows Andy Alvarez and Shirley Ramirez; USC Interns Kristian Castro, Daniel Coronado, Tanya Shah, Lilly Nie; and L.A. Times HS Insider.